There is no other way to end a series of Paris posts than with another sunset. And in this sunset there are twilights that lasted for hours, picnics along the Seine, and dinners where no one wanted to ever leave the table. There are afternoons of sun and puffy clouds, rainstorms that drove us inside, and winds that swept through the parks whispering of coming fall. There are brightly colored macarons, delicate pastries, and all the smells of the cornucopia of Paris culinary offerings. There are the strains of Vivaldi echoing through the Louvre corridors, Notre Dame held in a suspended crystal ball, and daredevils dancing with fire. There are tears, laughter, and smiles. There are views that overwhelm and details that enthrall. Behind this sunset is a multitude of memories and moments from a perfect month in Paris. 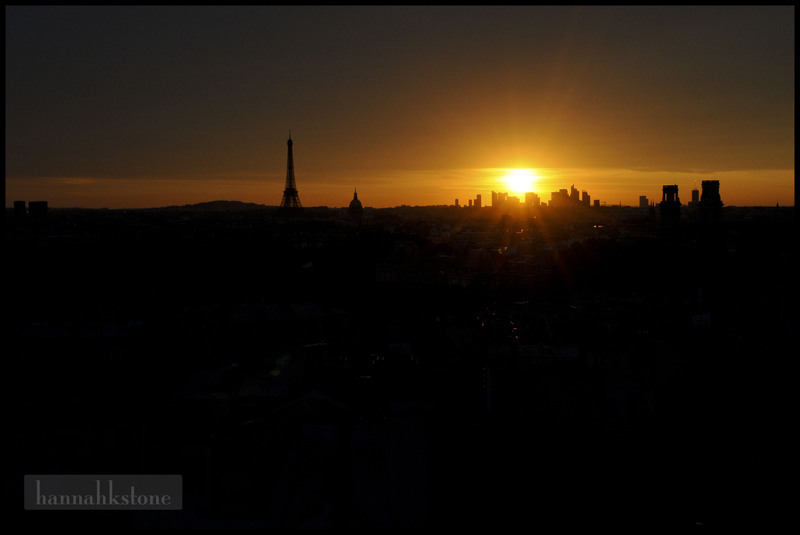 This entry was posted in Uncategorized and tagged Paris, photography, sunset. Bookmark the permalink.